La culture queer à l’heure des L.G.B.T.Q.I.A. Edward Burne-Jones, the British pre-Raphaelite painter of intensely romantic allegories is the subject of a major exhibition at the Kunstmuseum in Bern. The 100 works that have been united, some for the first time, offer the portrait of an artist little known outside of the UK, but whose quixotic imagination and luscious artistry are said by some to rival the greatest. Born as a movement during the Victorian era in England to combat “the frivolous art of the day”, the Pre-Raphaelite Brotherhood (also known as the pre-Raphaelites) overtly combated the formal aesthetics and mannerisms introduced by Raphael, the acknowledged master of the Italian renaissance. The pre- Raphaelites advocated a return to the linear simplicity of pre-Renaissance art. 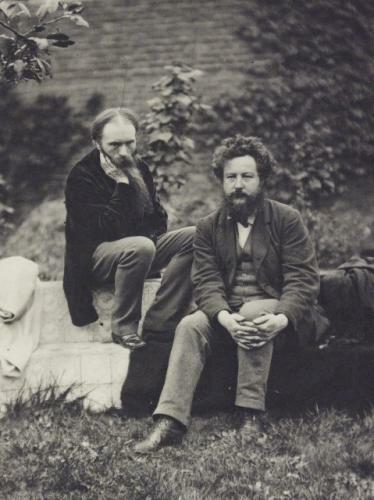 Edward Burne-Jones (1833-98), together with his inseparable acolyte, William Morris (1834-96), the writer and designer, adhered to pre-Raphaelites in defence of their desire to cultivate the nostalgia of yore, especially from the medieval times, as an art form. 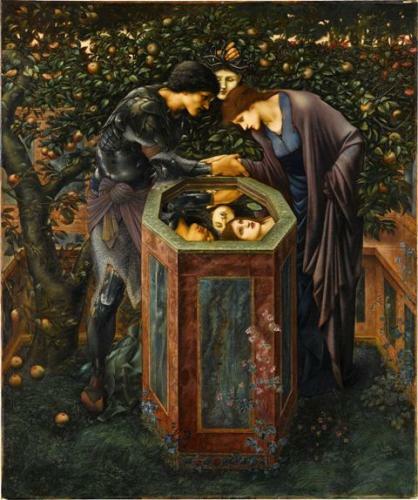 Whereas Morris was to found the famed Arts and Crafts movement dedicated to hand-craftsmanship in decorative arts, Burne-Jones was to devote his entire career to the illustration of scenes based on legends and myths. The exhibition at Kunstmuseum Bern pays tribute to the chivalry and romance that permeate the work of one of Britain’s major artists. 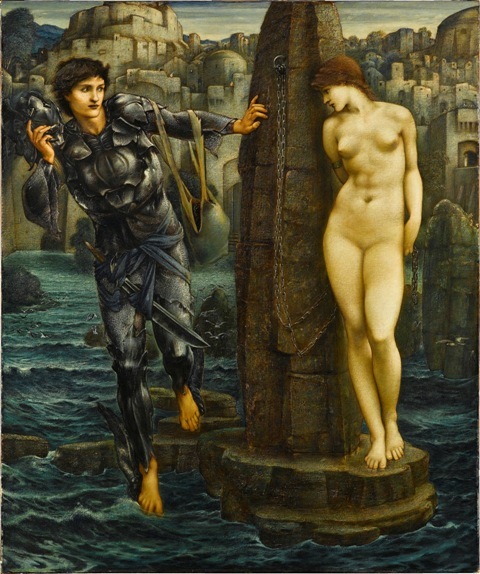 Conceived together with the Staatsgalerie Stuttgart, one of the few museums outside of Britain to own significant works by Burne-Jones, the show reflects the phantasmagorical themes that the artist returned to obsessively throughout his career. “I mean by a picture a beautiful romantic dream of something that never was, never will be – in a light better than ever shone – in a land that no one can define or remember, only desire,” Burne-Jones said of the sagas and tales that he conjured through his brush strokes. 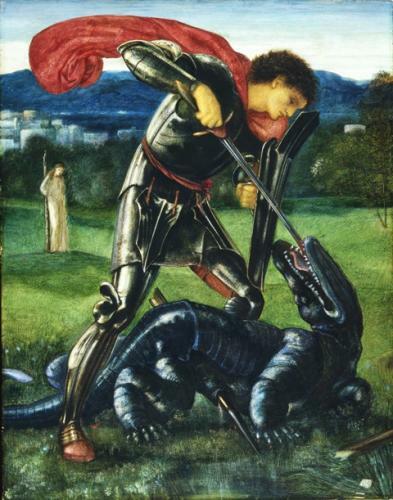 St George and the Dragon, Sleeping Beauty, Pygmalion, Cupid and Psyche are presented in separate rooms of the museum, offering narrative series that resemble, as the curators highlight, “comic-strip illustrations of today”. Regarded as a master of pictorial refinement, Burne-Jones never actually received any formal training. He and Morris met as theology students in 1853-55 at Exeter College in Oxford, but dropped out following a trip to Italy after which they decided to pursue, as autodidacts, a career in art. In a never-completed book project, The Earthly Paradise (the name of the exhibition), they retreated into “an imagination peopled by knights, dragons, and princesses, with fairies, gods and femmes fatales”. 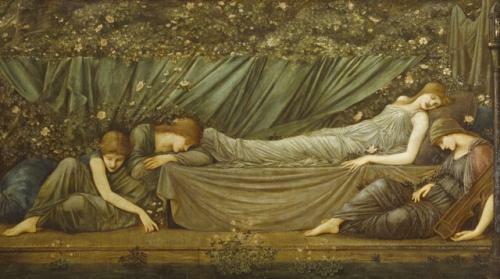 The Sleeping Princess, 1894/95, oil on canvas, 126 x 237 cm, Dublin City Gallery. Inspired by the fairytale collection of the Brothers Grimm, Burne-Jones kept returning to the subject of the sleeping beauty over a period of more than thirty years. Their collaboration was to extend to book illustrations, coloured glass, ceramic tiles, embroidery, tapestries, plaster reliefs and mosaics. Resisting the cluttered compositions and historical revival tendencies of the Victorian era, the highly-stylized flowing forms by the two artists are said to have contributed to the famous “organic” Liberty style propagated by the eponymous store in London and the general emergence of Art Nouveau throughout Europe at the turn of the century. Pygmalion and the Image: III. The Godhead fires, 1875–1878, oil on canvas, 99 x 76,3 cm, Birmingham Museums and Art Gallery. The tale of Pygmalion from Ovid’s Metamorphoses also deals with the subject of a sleeping beauty. Here Venus entwines her arms to give life to the sculpture created by Pygmalion. Venturing into “new art-historical territory” the Kunstmuseum Bern also suggests the influence of Burne-Jones on Switzerland’s popular nineteenth century master Ferdinand Hodler (1853-1918), of whom three paintings are exhibited in the main entrance hall. We discover a striking similarity in the approaches and compositions of the two painters, both considered to be the principal figureheads of Symbolism in their respective countries. “Both artists were preoccupied with movement and symmetry as the pivotal elements of composition,” explain curators Matthias Frehner, director Kunstmuseum Bern, and Simon Oberholzer, who believe that the two artists shared the desire to illustrate “the path of life until its termination as subject matter”. The exhibition in Bern is a rare opportunity to discover the strong imagery of Edward Burne-Jones and “worlds that resemble the fantasy universes of Harry Potter or The Lord of the rings by J.R.R. Tolkien” the curators boldly claim. Michèle Laird, née Haffner, was an international arts administrator (visual arts and theatre), successively in Paris, New York and London, before moving to Switzerland and becoming an arts journalist.